We have wanted to share our story for a very long time as we feel that it may encourage anyone else in similar circumstances. I first wrote to Shirley in June of 2011. I think it was almost 1 month later that she finally replied to me. At the time she said she had nearly given up on such things as Asian Promise. Some time prior to that she had ended another long-distance relationship with a man in Australia. I think he was less than sincere in his relationship attempts and after a very long time, and many broken promises to meet, Shirley finally ended the relationship. Before going any further, I would like to take the time to encourage all the men out there that are considering a long distance relationship to please be sincere in this, and also know that you will one day meet this girl that you are contacting. In doing this, always be honest and try to have all your travel documents prepared before you actually begin contacting her. Part of the frustrations of Shirley and I’s story stems from my lack of preparedness and my ignorance of how things were done in terms of procedures and such with the State Department in obtaining a passport. I think that most Americans probably go their whole life without ever bothering to obtain their passports. Anyway, as I was saying, we began corresponding sometime in July of 2011. It quickly went from casual letters every few days to an every day contact. I was always thinking about Shirley and our most recent letters to each other. I think it was sometime around here that I added an international plan to my phone in anticipation of trying to develop this relationship. She gave me her cell phone number and we began to text each other in addition to the letters. By this time I was already becoming aware of how shy she was, and so I was trying not to move along too fast. Contact was easy for me as I was working a 3rd shift job at the time and so I was awake at the same time that she was. I suggested that we talk on the phone and she accepted the invitation. I don’t actually remember what we said to each other on our first call, I think I was simply happy to hear the sound of her voice. I remember our first video chat simply because of the scare that came from it :). I remember that I was so intent that she be reassured that I was the person in the photos that I sent to her. I had arranged to speak with her on a Saturday morning. It was after work for me and I knew I would have enough time to get home and shower and then chat with her. I was anxious and nervous. When we first logged onto MSN to begin our chat we did so without video. I asked her if she was ready and she said yes, so I clicked on the button to begin the video segment of our conversation. When she answered the video call I saw her on my screen for the first time and I thought she was absolutely beautiful. I don’t know how much time went by, but I eventually came to realize that she could not see me at her end of the call! This scared the heck out of me. I kept thinking of all the people out there that lie about their appearance until you actually meet them in person. We Americans have seen movies and TV shows that satirize this theme. It was so important to me that she know that I was honest in who I was. At the same time I also realized that here I was being given the chance to admire this woman’s beauty without having to be worried or self conscious that I was staring (remember, she is very shy). It was conflicting emotions surely. We eventually resolved our problems with the video chat by having her restart her computer, and she was then able to see me. And so went our first video chat. It was not long at all before we were having our chats in video nearly everyday. In the morning for me and at night for her. I decided that I should go to China to meet with her and see if everything was as perfect as it already seemed to be. We originally agreed that it be sometime at the end of October, but then we moved the date to the end of November. Then I was told by the company that I worked for that if I took any time off then I would not have a job to come back to. I explained this to Shirley and she understood and grudgingly accepted it. I have read on the Asian Promise website that it is good to go and meet in person within 3 to 6 months, and I wanted to do it this way. I felt that they must know what they were talking about, after all, they specialized in this type of relationship! This was only the beginning of my problems in attempting to go to China to visit with Shirley. I am going to summarize here because it was a very long and tedious process, but first I found out that I could not fly. It took me 2 months or more to fix that mess. Then I found out that my passport had been revoked and that I must apply to get a new one. Most passports can be issued in 2 to 3 weeks. It took me almost 10 months to get a new one. It was one problem after another. There was even a point that the State Department told me that the other ID that I used to apply for the passport was too new! There was many times that I knew Shirley was beginning to be frustrated and probably even began to doubt that I was telling her the truth, but through it all we maintained our contact with one another. Every day we would chat with each other and I would tell her of my day and of any progress that was made in my paper-work. She would tell me of her day. We told each other everything by this point, what we wanted in each other and what we wanted with our lives. We even talked of telling our story to Asian Promise, but decided that we would wait to tell it until we were together. We did not want to tell a story until we knew it had a happy ending. I had already decided that this was the woman that I wanted in my life. I am pretty sure that she had decided the same. Finally in December of 2012, it began to look like I was at the end of the process and would soon be able to visit with Shirley. By now, as I have said I knew this was the woman that I wanted to be with. Surely I knew there was a chance that upon meeting we would not feel the same way, but I was confident that it would not be so. Already, I had bought, and lost, two round trip tickets to China, so we decided to wait until everything was in hand this time before buying yet another ticket. It was in January of 2013 that I finally received my passport and I immediately sent it away to get the Chinese visa (but not before taking a picture of it and sending it to Shirley). Amazingly, I did not have any problems getting the visa, and Shirley is somewhat smug about her Chinese government’s ability to process paperwork much more quickly than my American government’s ability. After all the other problems I think I was simply beginning to expect more problems. I flew to China and arrived February 1rst, 2013. I remember I was nervous the whole flight. What if she decided she did not like me, or that I was not the one for her? When I finally landed and saw her for the first time, I knew her right away. And she was even more beautiful than ever. We were married 16 days later, just after the Chinese New Year. We have been together every day since February 1rst. During that year-and-a-half that Shirley waited for me, never knowing that I would surely come, I had decided that I would give up my job in America, and stay here in China for a while. I know that Shirley is nervous in having a child and would prefer that she be near to her mother for her guidance and help, and I want her to have that. We work together in a company that Shirley started since I came here. I do her IT work and try to learn the rest of the business while she is the boss (She would tell you she is simply the boss’s wife.) We plan to be here for some years and then eventually return to America together as a family. There are many times we do not see eye-to-eye with one another. When we resolve our differences we usually understand that their are simple differences in our cultures that make us see things in our own ways. Many of our differences are simply caused by our different languages. I try to always remember these things when we communicate and always try to respect these things. I want to make a point here to the men. These women are not looking for a foreign man in a simple attempt to escape their native country! I think that in most cases these women love their country as much as you love yours. Do not think that you are rescuing her from an oppressive life or any other such stereotypical thing. They are open to the possibility of a relationship with a foreign man simply because they hope for a great relationship that they believe they can not have where they are (Isn’t that what you believe?) 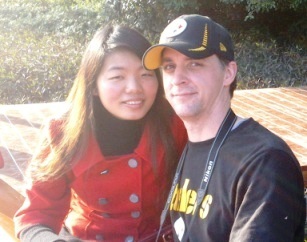 My wife has a family and friends here in China that are very dear to her, and I do not think of taking her from them. I know that when we do go to America to live we will still return to China often for her to visit not only those friends and family but also her country and her home. Again, I would like to thank you for all the work that you do and for your website. It is a wonderful thing indeed, and I would not have met my wife otherwise.